The gold standard in parasite control. ZIMECTERIN Gold combines ivermectin, a leading ingredient that controls a wide variety of parasites, with praziquantel, an ingredient that specifically controls tapeworms. Together, they provide excellent equine parasite control. ZIMECTERIN Gold is approved to control more species and stages of equine parasites than any other brand, including benzimidazole-resistant small strongyles. It controls 47 species and stages of equine parasites in all. Plus, ZIMECTERIN Gold was the first dewormer approved by the FDA to effectively control tapeworms with a single dose. Tapeworms have been recognized as a significant threat to the health of horses. And Merial backs every syringe of ZIMECTERIN and ZIMECTERIN Gold with a 100% Product Satisfaction Guarantee. 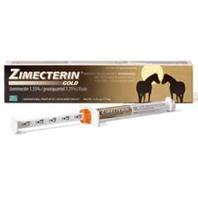 ZIMECTERIN Gold (ivermectin/praziquantel) is safe for adult horses and foals as young as 2 months of age. Each syringe contains enough paste to treat one 1,250-pound horse at the recommended dose rate of 91 mcg ivermectin per pound (200 mcg/kg) body weight and 454 mcg praziquantel per pound (1 mg/kg) body weight. Each weight marking on the syringe plunger delivers enough paste to treat 250 pounds of body weight.